This clean, elegant eCommerce template was especially designed for creating business professional online shops. 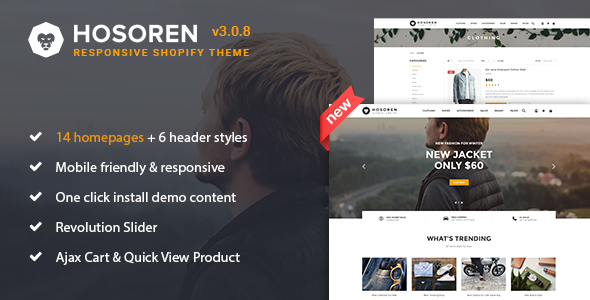 More than just an online retailer, Hosoren is not only best designed to display your products with beautiful image slider in header region, 2 product styles and 4 portfolio ones but also showcases multimedia content to go along with it including blog pages. It is retina ready, fully responsive and mobile-ready to ensure that your website will look stunning and work smoothly across all modern devices to give your users an amazing viewing experience. Hosoren is the right choice if you want to create professional and truly unique eCommerce website with ease. 4.09 average based on 46 ratings.